The same fleas that drive your dogs and cats crazy can make a home on your rabbit. The concept of battling the flea infestation is the same; however, rabbits are more sensitive to some flea treatments than cats and dogs. This makes safety an issue when treating a rabbit with fleas. Rabbits have thick fur, where fleas like to hide. Using a flea dust, such as a 5 percent carbaryl insecticide recommend by the Sacramento House Rabbit Society, is a great way to get deep under his fur. Start at the top of your bunny's head and pour the dust in a line down his back. Using your finger tips, rub the dust deep into his fur. Make sure you cover his chest, legs and stomach with the dust, while avoiding his eyes. Always wash your hands after handling carbaryl insecticide. Consider an over-the-counter spot treatment that is safe for preventing and killing fleas on rabbits. 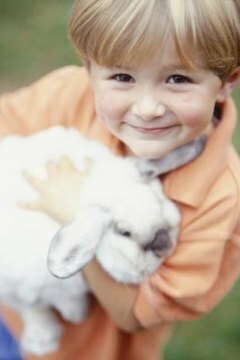 Contact your veterinarian to determine the product and dosage suitable for your rabbit. Make sure the product is applied to the back of your rabbit's neck where she cannot lick it off. If you have more than one rabbit, separate them so there is not chance of ingestion. Avoid using flea dips and collars on your rabbit, the chemicals may be harmful. Comb your rabbit's fur with a flea comb. This helps remove the fleas as they die. Use a fine-toothed comb made specifically for flea removal. Comb deep into the fur and remove the "flea dirt" or flea eggs close to his skin. Pay close attention to the area behind your furry friend's ears and around the inside of his legs where the fleas may hide. Clean the comb with alcohol and kill the fleas. Cleaning your bunny's home is important to help remove the fleas and prevent a future infestation. Remove your rabbit from the area and vacuum the carpet to draw out the fleas. Tie the vacuum bag in a garbage bag and throw it outside in a garbage can. Treat the area with commercial flea spray or fogger containing permethrin as directed by the manufacturer's label. Wash and dry all of your rabbit's bedding.